In the nineteenth century, travelers in eastern Utah had a 600 mile (960 km) detour to get across the Colorado River into western Arizona. In 1873 John Lee started a ferry service at the mouth of Glen Canyon. However, In the 1920's it was decided to build a bridge five miles downstream from Lee's Ferry, across Marble Canyon. The bridge was constructed with tie-backs supporting the two sides until they met in the middle. The area was extremely desolate and when the ferry sank killing three workers, people had to drive 800 miles to get across the river until the bridge was completed in 1929. It's a steel, deck arch with laced spandrel columns. It has a span length of 616 ft (188 m), an arch rise of 90 ft (27.4 m), its 467 ft (142 m) above the river and has a width of 18 ft (5.5 m). However, the bridge couldn't carry heavy trucks, it made a kink on U.S. Route 89A that caused many accidents, and it was too narrow to carry two lanes of traffic. In the 1990's it was decided to build a second crossing to address these problems, and to make the old bridge a pedestrian crossing. 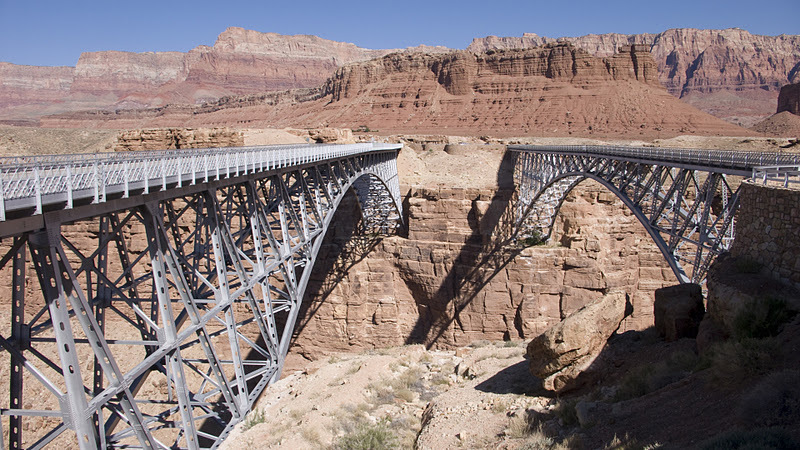 The new Navajo Bridge is another steel, deck arch, but longer, wider, and able to carry heavier loads. Arch Bridges: Navajo Bridges by Mark Yashinsky is licensed under a Creative Commons Attribution-Noncommercial 3.0 United States License.